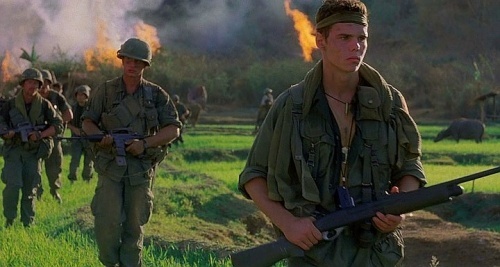 BRAVO-6 keeps bringing more and more Oliver Stone's famous movie- Platoon characters on market and as the fifth figure of the series, they released non-stop swaggering boy of 25th Infantry Division Bravo Company - shotgunner Bunny acted by Kevin Dillon. The figure comes is standard BRAVO-6 50x80x25 mm cardboard box in light brown color. A painted photo of the assembled figure covers the front , as the website and e-mail address is noted on the back of the box. Inside the box, the parts are represented with the casting blocks and small parts are packed in a small plastic zip-lock bag to avoid unexpected damages. A water-slide decal sheet including name tags, rank insignia and division/unit badges is also represented in the box. The unit patches, rank and name tags were in yellow color in first released kits, but BRAVO-6 corrected that and now the decals are OD Green color and Black lettering. The figure is sculpted by Russian sculptor and owner of BRAVO-6 Vladimir Demchenko and comes in 8 medium grey resin parts; 3 body parts and 5 pieces of personal gear. The resin quality is good. No air bubbles on the figure, but note that some parts are fragile and need attention when seperating from casting blocks. The only problem on casting is the thick casting block on the helmet which needs a careful clean-up not to harm the helmet. The figure's body is cast in one piece, only the lower arms are supplied as seperate parts. The face is very nice sculpted and exactly reflects the distrustful and scared but a baby face look of Bunny. A headband is tied on his head and he carries a sweat towel on his neck. He wears US Army tropical combat uniform with 4 flip-top pocket jungle jacket and 2 cargo pocket trousers. The cloth folds of uniform, pocket details, web belt and suspenders, harness of backpack, ammunition pouches are well represented. The ARVN rucksack/ Ranger pack is cast on the figure and rectangular pockets, straps and buckles are well defined. Some very nice details are added to the rucksack on this figure. An olive drab soldier sock full of three C-rations cans is hanged between two pockets of rucksack ( please see reference photos at the bottom of review ) and a pop-flare, an aluminium launch tube containing a rocket propelled signal carrier, is inserted inside the left rectangular pocket. Below the rucksack, he carries a rolled poncho. The left lower arm is posed to hold a cigarette and makes a good fit to the upfolded sleeve on the left arm of figure. The right lower arm is cast together with the upfolded sleeve and it makes the assembly of this part to the right upper arm on the figure easier . He carries a shotgun- a Remington 870 shotgun with open blade sights. 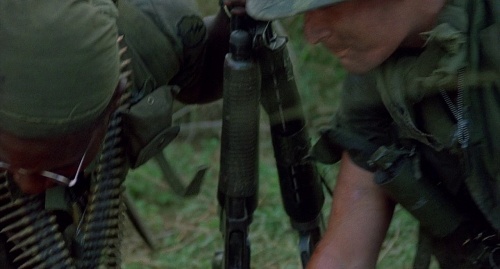 When painting the shotgun, I advice you to paint the trigger guard in metal because the version that Bunny used in the movie had a stainless trigger guard as you may see in the photos. Photo1 and Photo2 . M1 steel helmet with canvas cover and helmet band with 2 shotgun shells. This part is optional and the figure can be built with or without helmet. Great subject, perfect sculpt, nice casting. An unique figure to paint for all Nam modelers and especially for Platoon's fans. Highs: Very nice sculpt and cast. ARVN rucksack has great details on this figure and decal sheet is a bonus for many modelers who never likes to paint insignia and badges. Lows: Extra care needed when removing helmet from casting block. Verdict: Great figure to display as a Platoon character or as a part of a Vietnam dio.